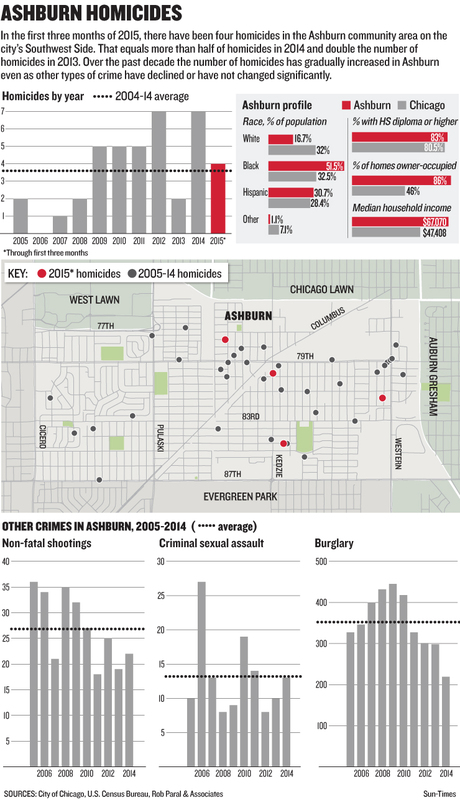 Killings on the rise in typically quiet Ashburn | Homicide Watch Chicago | Mark every death. Remember every victim. Follow every case. The most recent killing happened March 19 when 24-year-old Joseph Burdine, of the 8000 block of South Troy Street, was fatally shot in the back in the back in the 7900 block of South Kedzie Avenue. Nobody has been charged for the killing. The three other murders have all been solved, authorities say. One started with a domestic fight and two were drug-related. On Feb. 4, Joshua Poe had smoked synthetic marijuana just before fatally shooting his “good friend” Curtis Lyons, 20, in the face in the 3100 block of West 84th Place, prosecutors said. And on Jan. 14, Omar Dixon shot 24-year-old Terrence Harris to death during a drug deal in 8100 block of South Artesian Avenue, according to prosecutors. Nine days earlier, Andre Brown fatally stabbed his 54-year-old mother, Damita Collins, at her home in the 3500 block of West 77th Place after she criticized him for not having a girlfriend, prosecutors said. While murders hit a decade long high of seven last year, and are on the rise again this year, police data indicates other crimes are down in Ashburn. Non-fatal shootings have been trending down from 35 in 2008 to 23 last year. And burglaries, which police Supt. Garry McCarthy calls a bellwether crime, have fallen in each of the last five years. Yet several people who live and work in the community are worried that crime will spike as the weather warms up. Security guard Leonard Sweat said he moved from Ashburn to south suburban Matteson because he feels “a lot safer” there. Some community members believe the solution to improvement lies within the community as much as police. And Rocky More, who teaches martial arts after school at Ashburn Community Elementary School, believes the community needs more programs to keep children off the streets. “We need to help them do something positive in a safe environment… We don’t have enough people working in the community,” he said.